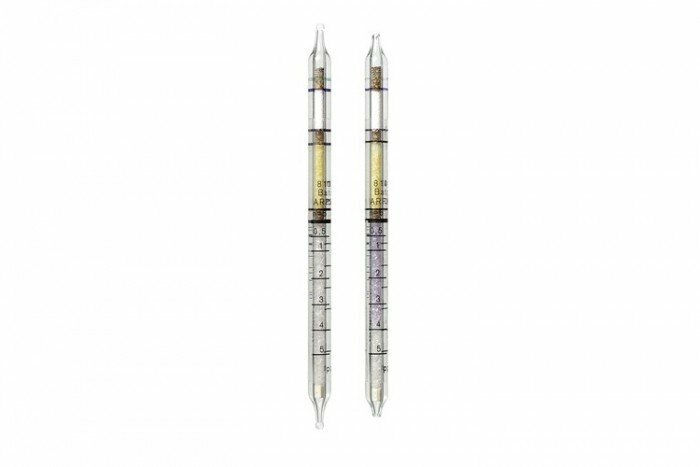 These Vinyl Chloride tubes from Drager Safety have a measurement range of 0.38 to 3 ppm. They detect a range of substances including 1,1-Dichloroethylene, 1,1,2,2-Tetrabromoethane and 1,2,4-Trichlorobenzene. The tubes have a shelf life of 2 years and come in a pack of 10. 100 ppm hydrogen chloride, 20 ppm chlorine, 10 ppm carbon tetrachloride, 10 ppm chloroform or 5 ppm perchloroethylene are not indicated. Trichloroethylene and chlorobenzene are indicated with less sensitivity. 1.1-dichloroethylene is indicated with almost identical sensitivity. Vapors of organic solvents consume part of the oxidation layer so that the resultant reading is somewhat lower. Examples: a reading of 0.5 ppm vinyl chloride will occur by 5 ppm vinyl chloride + 100 ppm butadiene or 5 ppm vinyl chloride + 10 ppm ethylene.